This is the last official holiday of the summer. What are your plans? Whatever you do, please take time to enjoy the moment. Forget about the problems you have been dealing with. Put them on the back burner for now. There isn’t much that can be done about them any way at this point in time. Just take the long weekend to try to relax and unwind the best that you can. If it’s where you can, plan an outing with your family or friends. Take advantage of every single moment that you can spend with those that you love. Make memories with these precious people in your life. A lot of times we are sitting in front of someone, but we are not present with them. Our minds are a million miles away, and often times, it shows on our faces and in our lack of contributing to the conversation. Put down those cell phones also and pay attention the ones that are there with you. Vow to be intentionally focused when you’re with family and friends. Focus on them and enjoy the moment instead of thinking of what is on your “to do” list next week or what work you’ll have to go back to after the holiday weekend. Simplify your life. Life is to be lived and enjoyed to the fullest not packed with so much to do with so little time. Take this weekend to just … be. Whether it’s being one with nature, being in the presence of those you love dearly, or just being still and one with God and the universe. Enjoy each and every moment that you have been given this weekend. When you need to “vent” to someone, when things are troubling you and you feel like you just “have” to get them out, who do you turn to? In the past, I have gone to friends or family members when I needed to talk. This has helped, especially when the person, like my daddy, listens, comforts, and loves. When others start to condemn or criticize, that is when it starts to get a little touchy. Often times you just need someone to “listen.” While I don’t expect everyone to sit quietly and take in all I’m saying without uttering a word, I would like the words to be respectful and loving that they speak to me, especially in my time of need. If I have trusted them enough to talk to them about what is bothering me, surely they could have some compassion and carefully select the words they speak back to my troubled or broken heart. And … surely what I say would be kept in the strictest of confidence when taken to a trusted friend. That is how it is supposed to work, but unfortunately, I have learned a very valuable lesson the hard way just recently when I have taken my broken heart and placed it gently in the hands of friends. I shared things that really were hurting me and that threatened my family. I spoke openly about those things as a way to cleanse my soul by not internalizing any more. I was letting it all flow freely from me because I just had to get it out. What happened next wasn’t pretty. I later discovered, by one friend’s admission, that she had talked privately with another of my friends. The two were almost comparing notes on what I had told them, and when one didn’t know one piece of information, the other offered it up to them. My friend admitted her part in this, even sending me the private messages shared between her and my other friend. I read through all of the messages almost in disbelief initially. Then, there were some proud moments as I read how each friend cared so much about me and really loved me. I know they were concerned for me with what had just taken place and threatened my family. I could see that in their words, but the more I read, the more vicious some of the messages appeared to be … and some times they were aimed at my beloved … while other times they were aimed right at me. Now that it was finally out in the open, both friends have apologized to me … but it still hurts and makes me unable to fully trust again with intimate details of my life. Maybe at some point I will get past this and be able to share again, but for now, I will have to return to internalizing a lot of things. It has dawned on me that when I have felt and currently feel that I have no one to talk to … why am I not turning to God? It hit me like a ton of bricks. He is the One True Friend we always have, and He loves us unconditionally. Why, then, do I trust others to go to them instead of trusting GOD by taking all of my worries, concerns, fears, doubts, and hurts to HIM? Think about it for a moment. Why not take ALL of your worries, cares, and concerns to Him? The bible says to cast ALL of our cares on Him, yet so many times we hold them in, we fret and are consumed with anxiety over things that we feel we are facing alone. The truth is that if we’d carry ALL of our problems to God as He has asked us to, we wouldn’t feel so alone. We wouldn’t have to try to solve all of the world’s problems because we do not possess the power to do so. Some times we can’t even help ourselves with OUR problems. But I know One who can … God! I know that a friend’s voice is clearly heard. If we call them on the phone, write a message to them, or see them face to face, we can clearly hear their tone of voice to know how they are saying it or as we’ve gotten to know them, we can pick up their “tone” even in written words. We get feedback from them instantaneously. We hear what they think and how they feel about the situation. Often times they hold nothing back, even when they should due to the impact it has on our hearts and souls. Maybe that is the attraction, the draw to sharing all with a friend. We can hear them in return. Do you feel that the silence is deafening? When we take our problems to the Lord, do we feel that we get nothing but silence in return? Consider this. We can’t hear God’s voice whispering if we have so many distractions and don’t still our minds long enough to consider what He may be saying back to us in return. Yes, we talk to God … but consider that He wants to speak to US, too! And even if we don’t hear that still small voice right away, we begin to see His hands at work in our lives. He knows what is going on with us any way, but He wants us to come to Him. He wants to hear it all – the good, the bad, and the ugly. He wants us to trust Him. I can guarantee you that God won’t go behind your back to talk about you. I can guarantee you that God won’t hold a grudge against the person or situation that caused you great pain either. That is yet another problem when you take things to friends or family members. When you’re hurting in the moment and you need a way to release it by talking about it, once it has been spoken and leaves your body, heart, and mind … you are able to regain your composure and work things out even better than before in your life. Yet, the friend or family member you carried your concerns to will NOT be so quick to release the feelings they have about the troubles you shared with them. If you were having problems with your husband, child, or in-laws, the friend that you went to will not be so quick to release their feelings about the situation. Long after you have moved on from that situation and things are better between you and the person, the one you went to will continue to hold on to the problem and will often times bring it back up to you, as if you needed a reminder. I can assure you that God forgives you if you’ve wronged someone, and I can assure you that God forgives others that wrong YOU, too, if they ask. Yes, the one you initially had problems with where you needed someone to talk to about what was going on … and yes, even the one that talked behind your back with your other friend about your problems. 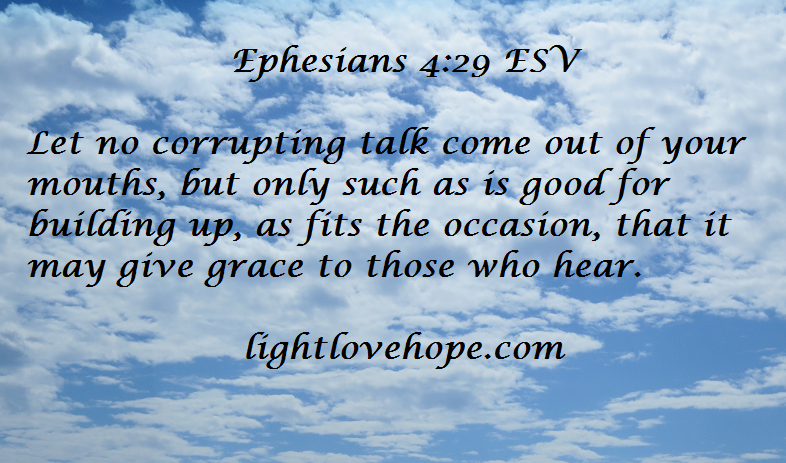 If they ask for forgiveness and truly mean it with their whole hearts, God will forgive them, too. We are all children of God, and He loves each and every one of us with the same unconditional love. It doesn’t matter what we’ve done, while it may break His heart to see it, I believe He will still forgive us of our wrongdoings if we ask with a sincere heart and repent from our sins so we don’t do these things again. Repent means to ask forgiveness and then turn from our sins! If you took part in something that hurt someone else and you asked for forgiveness from them, be sure that you also ask God for forgiveness for your part in all of this. If you ask with a sincere heart, you will be forgiven. Then don’t allow yourself to get back into that situation again. Don’t betray a friend by talking about what they shared with you with someone else. I can assure you, God will never do that to you. My lesson learned the hard way this week: when you need to vent … vent to God, instead. Congratulations, Kristi! We will be in touch with further information on how to claim your prize! Thank you, again, to everyone that entered, and please stay tuned for more giveaways to come! The giveaway was first mentioned here along with the review of Jacinda’s book. For those that were interested, there is still an opportunity for you to purchase the book. This book really and truly has come into my hands at the exact time that I needed it! 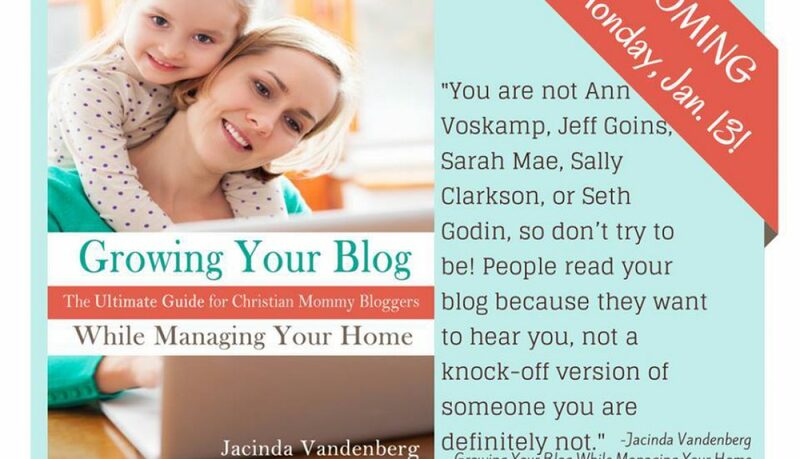 Honestly, I needed to read the words Jacinda Vandenberg has so eloquently written on each page in this book! Jacinda addresses common concerns we all have in the blogging world. Being that I am so new to blogging, I can use all the help I can get and appreciate her sharing the ins and outs of blogging with all of her readers. Simplifying Your Life – Learning How To Rest. Over and over in this audiobook, Joyce stresses that it does not make any difference any way – in the situations she has described or in any situation that we get upset over – so why get so worked up over it? Instead – just change your approach. Joyce continued on by saying that we even pray wrong. Joyce said to pray something Jesus can answer that is in the will of God! She went on to say that, just like the bible says, in the world you will have tribulation, but cheer up – He has overcome the world. She says to go all the way through with God this time for victory! She suggested we pray that we are strengthened with power to bear all things, for patience, strength to go through, not for things that aggravate us to go away. She said she puts on the behavior to have power to endure whatever comes her way with a good attitude. It wouldn’t impress anyone if we never had any problems, but if we have similar situations and yet remain happy, peaceful in a consistent attitude – now THAT is impressive! Let us be happy, calm, peaceful – she suggests we join in or be by ourselves in our own emotions. She talked about how misery loves company but for us not to get upset when we can’t bring someone else down. She also talked about how it makes us angry when we’re around people that are happy when we aren’t, and if this is the case, we need to change our approach. We are back to continue discussing how we can simplify our lives by learning how to rest. Joyce Meyer has a lot to say on this subject, and we have thoroughly enjoyed all of the information that she shared in her audiobook! She explains that when emotions take off in a different direction, we don’t need to jump on board with them! We become upset initially. The more we talk about what happened, the more we react to what occurred, and the more upset we get about that situation. Let’s work to change that. Another thing that Joyce addressed is that we are to remain calm in order to hear from God. It is better for us to remain in wisdom. She said that we’ve probably all heard it said before, but we should NOT make a decision when we’re emotional. She stresses to make sure we will be happy when the emotions subside. She talks about feeling the high of emotions when we’re looking to purchase something. Whether we go into debt or not, be sure we can afford it! Joyce says this is especially important if we have to lay plastic down in order to pay for it. She suggests that we think on it, and if we want whatever item we’ve had our eye on that our emotions tried to take off with, to take the time to think on it and then go back. If we take our focus off of the item and put it on something else, the emotions will subside. You will save yourself from going into a lot of debt this way or getting yourself into trouble buying things you really shouldn’t. Joyce told a story about how she purchased some jewelry one day. She was overcome with all of these good emotions when she saw the jewelry sparkling under the lights in the jewelry store. She joked about how the lights must be different in the jewelry store because when she purchased the jewelry and brought it home, it did NOT sparkle under her lights at home like it did under the lights at the jewelry store. She thought about her purchase, and then the very next day she decided to take it back for a refund. She knew the person she bought it from, so she had to humble herself and freely admit that she purchased something she did not need. Actually, she had pieces very similar to it at home already, so she just needed to return it and admit that she acted upon her emotions when she purchased it. Wow! What a lesson to be learned here if we just reign in our emotions or think on it overnight! My husband and I just recently did that this past year over a car purchase. We didn’t necessarily need another car, but we saw one that caught our eye. We were so close to buying it that we could smell the leather long after we had gotten out of the car after a test drive. Oh, the color was a beautiful candy apple red, and it called out to me. I slide behind the steering while and into the driver’s seat and felt pure joy when I drove down the road taking it on a test drive. The salesman let us take it home, and we were so very close to buying this car. We took it back, though, and decided to think on it over the weekend. I am SO glad we did because when we shifted our focus, the grip of the new car smell no longer had a hold on me. I was able to rationally think about this purchase and realize that I was acting on my emotions when I was willing to sign on the dotted line. Thankfully and proudly, I did NOT buy the new car, and I did NOT go into debt or deplete our savings account on a purchase that would have been lead by my emotions! Whew! That was a close one! Before we dive into discussing the first part of Joyce Meyer’s CD where she is focusing on learning how to rest, let’s take a moment and just clear our thoughts the best we can. Take a deep breath in through your nose, hold it a second, and then blow it out of your mouth. Ready? Go! Do this a few times to just relax yourself and imagine that we’re inhaling all of the goodness of God and exhaling all of the things that have tried our patience and nerves today. As we do this, let’s imagine in our minds that these things lose their grip on us, and feel all of those things release us as we breathe out! Joyce immediately goes into things that wear us out: our thoughts; decisions; talking; multi-tasking; worries and fears; excessive concern over what other people think of us and of what we’re doing; being insecure. These are all things that just zap our energy, draining us mentally and emotionally. They absolutely wear us out! Joyce advises us to stay calm no matter what goes on in our lives or what concerns arise. She talks about how much energy it takes from us and how sick we can become because we never shut down inside. She lays it all out for us so plainly that if we’re upset, we need to just calm down. If we’re mad, we need to try to get over it. If we’re offended, we need to try to get over that, too. She said it is just an endless cycle of upset that leaves us depleted and miserable. All of this is easier said than done, though, right? Our flesh is weak and we just want to get upset and hold on to these feelings. Doing so only hurts us! We get so upset, then we’re wondering why we’re unhappy and plain miserable. Joyce goes on to say that the world is not going to change. The devil and people won’t change either. Even if, by chance, those “problem people” we’ve been dealing with do decide to change, there will be others planted in our lives that aren’t so nice. Upon realizing this, she had a revolution that since those things are not changing, WE have to decide to change, instead! Joyce told a story about how her husband, Dave, always had peace and that she was extremely jealous of the peace that her husband had. How did she have so much turmoil in her life and yet her husband, who was dealing with the same stuff that she was, managed to be happy and was feeling good every day? I am always drawn to the self-help and faith/devotional type of books. It should come as no surprise that one of the firsts that I picked up was none other than Joyce Meyer! If I was getting paid for every time I mentioned her or her books, I would be a rich woman. But, alas, I am not. I share because I truly do enjoy reading what Joyce has to offer. I am always entertained by her humor and my soul filled with the words she shares. She mixes the bible verses in with stories of her life and adds in a little bit of her dry sense of humor that just tickles me! What makes it funny is that some of the things she jokingly “complains” about in her sermons are things that we know we all do in our own lives but don’t want any one else to know that we do it! She has it down pat, though, and it’s just funny how she relays this to us that she’s “been there, done that” too! You’ll be surprised, now, to read that I put her books back on the shelves. I had seen some of those titles before and had even read through a few of those books a while back. My attention, then, refocused on the wall straight in the back of the store where audiobooks were found. Much to my delight, there were about seven audiobooks by Joyce Meyer on that bookshelf! Score!! ~giggle~ I did not buy them all tonight as I did not want to break the bank! Even though they were at a reduced price, they were still asking a pretty penny for some of those audiobooks because they are in excellent condition.